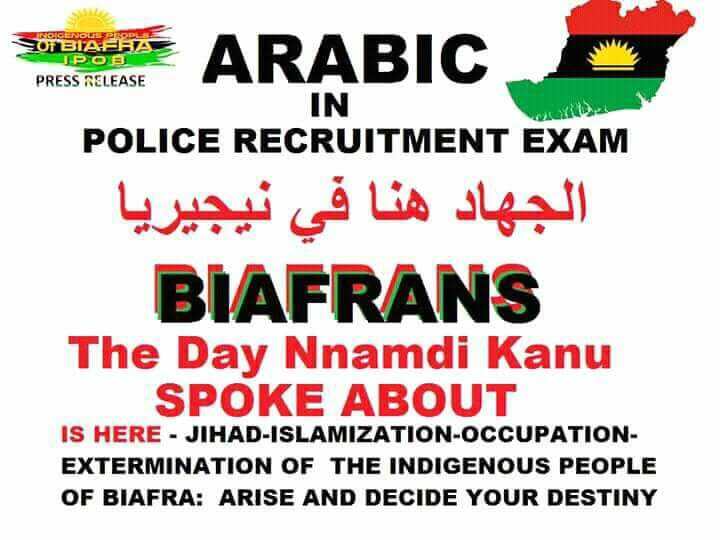 It appears there is no length the present 'Buhari' administration will not go in its futile quest to counter IPOB agitation for a sovereign independent nation of Biafra. After another resoundingly successful 30th of May sit at home order from IPOB, it came to us as no surprise when Arewa north moved to pacify the Yorubas by declaring June 12 as the new Democracy Day. Since it has clearly dawned on them that IPOB is the authentic voice of the people of the East, thereby rendering their slaves in Ohaneze Ndigbo and governors lodges in the South East impotent, their next best move is to gain the confidence of the West in order to checkmate the rising influence of those that have come to forge an alliance strong enough to rattle the status quo. Our successful sit at home order in 2017 prompted Arewa Consultative Forum to direct their youths to issue Igbos residing in the North with a quit notice. This culminated in a brutal military invasion of the home of our leader Mazi Nnamdi Kanu sanctioned by Nnia Nwodo’s Ohaneze and South East governors in what they termed Operation Python Dance. They came to kill, maim and 'crush' IPOB for good. An equally devastatingly successful May 30th, sit at home called by IPOB in 2018 have sent shockwaves to the ruling cabals in the north that IPOB not Ohaneze Ndigbo or Igbo governors are the true representatives of the people of the East. As with the clamor for restructuring, it can now also be confidently stated without fear of contradiction that this overriding need to checkmate IPOB is the sole reason behind the June 12 Democracy Day announcement by Aso Rock. A cynical move designed to truncate any East/West alliance or understanding with regards to a renegotiated Nigeria before 2019. Isn't it odd the same people that detained and killed Abiola are now cosmetically rewarding him with a posthumous presidency so close to an election year? The north is desperately hoping that Yorubas will once again accept this Greek gift and in turn reward them with their votes in 2019 as they did in 2015. In the process of renewing for another four years the tenure of the most mediocre, barbaric, brutal, despotic, genocidal and undemocratic regime in living memory. Yorubas must spare a thought for the people in Middle Belt and what they are experiencing in the hands of the same Fulani terrorists, before deciding to embrace 'Buhari' with open arms. The question most people are asking is, when will Yorubas bring to an end their one-sided relationship with the north? Similar overtures were made to the West in the run-up to the Biafra-Nigeria War when Chief Obafemi Awolowo was offered vice president to Gen. Yakubu Gowon which he accepted thereby abandoning his earlier agreement with Ojukwu. Thankfully eminent statesmen like Pa Ayo Adebanjo has come out to condemn the whole posthumous charade. We must not forget that it was the same core Arewa North that imprisoned Chief Awolowo. It was an Igbo man and later Biafran soldier Chukwuma Nzeogwu that led a coup that it's sole aim was to release Awolowo from prison and install him as the Prime Minister of Nigeria. It was another Igbo man, Ojukwu, that eventually released Awolowo from prison but upon his release went back to the north and superintended the second worst genocide in human history. The same thing happened with Obasanjo's civilian presidency, which again was another move by the Fulani caliphate to assuage grieving Yoruba people after the annulment of June 12 and killing of Abiola by the same north. Today even Obasanjo who was once their darling is now in their firing line. This big brother small relationship has always been at play between the core north and Yorubas for centuries. Look at what Fulanis did to Yorubas in Ilorin where Afonja a Yoruba prince was temporarily made the political head of the invading Fulani Islamic army to get him to turn against his fellow Yorubas. At the end of that campaign, Afonja was killed by the Fulanis and his land converted to Fulani emirate. A Yoruba Oba will never in this life sit on the royal throne in Illorin. Illorin emirate has become the exclusive prerogative of the Fulanis. This unfortunate outcome and Yoruba national disgrace were made possible because a Yoruba man accepted what appeared on the face of it an exalted political position not knowing it was a Trojan horse. These mistakes of the past must not be repeated by this present Yoruba generation.